Type location Zimbabwe (Smithistruma nykara sp. 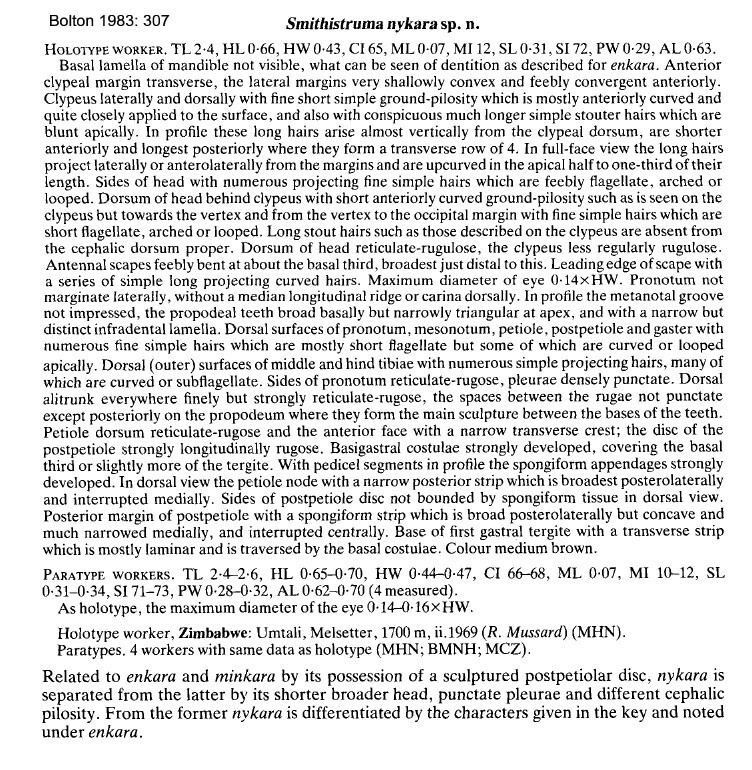 n., Bolton, 1983: 307, not illustrated, worker) Umtali, ii.1969, R Mussard . WORKER - TL 2.4-2.6 mm, HL 0.65-0.70, HW 0.44-0.47, SL 0.28-0.34, PW 0.28-0.32; postpetiole with spongiform strip narrow or interrupted dorsally; gaster with basal transverse strip traversed by the basal costulae; medium brown. The photomontage of the holotype is collated from http://www.antweb.org/specimen.do?name=casent0102551. The photomontage is of workers from Tanzania, West Usambara Mts, Lushoto District, Grant's Lodge; collector Vasily Grebennikov.